Raw Materials - All natural materials are purely comes from handcrafted wood. Available in different variations. Jumbo Pacific's Raw of Materials comes from a variety of handcrafted wood, coco, shell, bone and many more just to mention a few. It may come in variety of colors and designs as preferred by the need and requirement of the customers. JPRC074 - Buri nuggets in dark green color. JPRC075 - Buri nuggets in red color. JPRC076 - Buri nuggets in natural color. 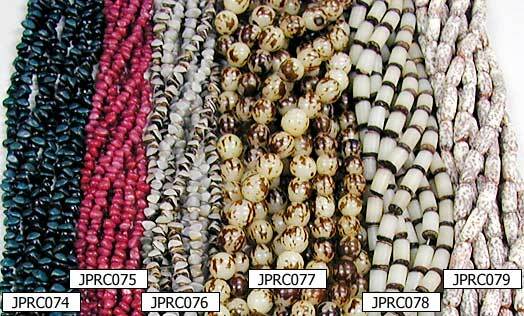 JPRC077 - 12 mm Tiger beads in natural color. JPRC078 - 7 x 12 mm Buri tube in natural color. JPRC079 - 8 x 15 mm Salwag tube in natural color.